It is climate appropriate to wear woollen mittens and scarf, I noted when dressing for the morning walk today. Air is still cool, no matter in what language you read the thermometer. There are batches of snow everywhere but the sky is open and the sun is shining. My usual walking route passes by three community gardens, a small forest and a park. Having exited the park today, I crossed a narrow street and saw a young lady reading a book in the far end of a grass field. She had spread a yoga mat on the wet ground and was clearly enjoying the weather - in bikini. Yes, bi-ki-ni! A noun: A woman's scanty two-piece bathing suit. Her uninhibited enthusiasm declared it is spring! Finally! Not as daring as she but suddenly feeling somewhat overdressed, I slipped the mittens in the pocket and unzipped my coat. A smile revoked a giggle as it occurred, once again, what an atypical place Finland is. After a long, dark and silent winter, people surrender to the sun as soon as the first rays appear. A behavioural pattern similar to bears disoriented from hibernation! To celebrate the birth of a season of joy, I will share a beetroot dumpling recipe. If you are fond of unconventional gastronomy, you will like the dumplings. Colourful, made of simple ingredients and fun to assemble, they offer a delightful entrée or lunch. Once you have prepared the dough and filling, they fly from the pot to the plate. Although I’m not promoting frozen food, the dumplings could be made in quantity, frozen and boiled as needed. From the rest of the dough you may roll pasta stripes. However, make them thinner than on the left image! Thickness and roughness highlights visual interest rather than taste. I recently made my first successful ravioli, and as I was searching my ingredients I saw that I had beets. I almost used them but I wanted to make sure I made one simple success before adding any interesting flavors. 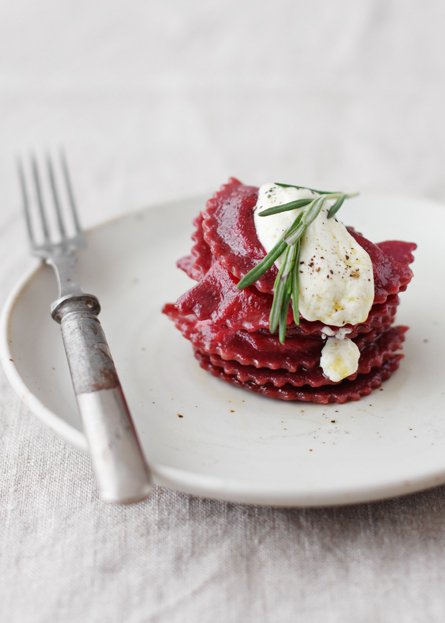 Now I'm inspired to try beet pasta! Those dumplings are splendid! I really love their pretty color. As usual, I admire your photography skills. Roasting the beets before using is a great idea, and I like the hing, garam masala and your Indian touch to these Raviolis. Beautiful clicks as usual! Gorgeous pink post! Love beets for their color and it's highlighted so well in your recipe. What a color!Thanks for sharing with us this great recipe! Love the color- how delightful and beautiful! Wow!! These photos are stunning and inspiring! Definitely making this. I love making dumplings at home but these ones just blew my mind. The color .. the gorgeous pink is so pretty. I can't take my eyes off! Wow! So colorful! So innovative! These look delicious! I'm glad you like the recipe. I planned to post more pictures, but my stomach turned upside down when I saw all that pink on the draft :-). Moderation is the key, also with colours! Harini - the recipe is easily veganizable. I would love to see your take on it! Some sort of a pesto filling would be nice. Imagine the contrast of pink exterior and green interior! What a beautiful new blog discovery. And...I see congratulations are in order for your Saveur nomination! I can't wait to see more of your photography and delicious recipes. These are absolutely beautiful. I really want to try making them. I a totally impressed, I have made other pasta but never with beets. Lovely. Saw the photo on Facebook of a food friend who 'pinned' it. then i searched and finally found you..... excited to try the recipe. Gorgeous pasta. A simple but absolutely stunning recipe Lakshmi! The most beautiful dumpling I have ever seen Lakśmi. And belive me I have seen (and done) thousands of them. The best for me are RUSKIE PIEROGI. Do you know what it is? I'll make you some when you come. Inspired to make this. The color of the dumplings and stripes is so lovely. Happy Spring, Lakshmi. Cintamani - my mother-in-law makes ruskie pierogi. I'd love to taste some of yours, too. Your food looks so tasty and your pictures are beautiful - I was wondering what lens/camera you use? Thanks, Suchi and tophearth :-)! I'm using Canon 40D with 50mm f/1.4 lens. What a beautiful combi of great pics n lovely words. I always admire the simplicity & vibrancy of ur pics !!! Giggle!! I think I would have laughed out loud to see you all scarves and mittens and a lady in bikini sitting in an open field at the same place!! oh well. I am gorging on your photographs as usual. I have never made ravioli at home. You make everything look so easy! Thank you for such a lovely recipe!! I made them the other day and have been enjoying the contrast of sweet beets and sharp cheese. I used a 50/50 mix of Cow's-milk feta and quark (a cheese somewhere between yogurt and cream cheese with a slightly tangy flavor). Mmmmm! Emma, great news! I'm glad to hear you tried and liked the recipe. Quark is a good ingredient. I use it a lot in pies, sweet and salty alike. what a beautiful recipe. i love beets and i look forward to making these dumplings with them. beets are truly inspiring, as is your blog! thank you for sharing. What camera and lens do you use Lakshmi - I would love if you could share some of your photography tips. The photos are ( needless to say ) are an amazing visual treat !! Corners and Moments - I'm using Canon 40D with 50mm f/1.4 lens. Maybe I will write a post about photography/styling at one point...but now I'm too busy. We love beets! Can't wait to try this recipe - thank you for sharing. Gabriela - beets are the best! I love them in every possible way, but most of all, roasted. Good luck with the recipe! Mmmm.... I'm always looking for tasty and fun beet recipes. Thanks! sounds great! we have lots of beets this summer, and I don’t have many recipes for them! I love beetroot and recently planted some in the backyard. I made these for dinner tonight and they are absolutely fabulous! I can't wait to make them for my family over the holidays. Clever idea of using beetroot. Gorgeous dumplings! Didn't even think that beet could be prepared in such wonderful ways! These are wonderful! I was snagged by the photos and my mind couldn't rest until I made some...they are well worth the effort and I will be making them many times more. Thank you! Nice to hear you liked them! You'll find the recipe by clicking the picture above that says "print and read the recipe".